Donkey from work who uses Halloween as an excuse to dress like a freak. He likes to show off, so I thought I’d help. Nate, how are ya doin’ on rebuilding your rep points? Yes, those are pumpkin underpants . 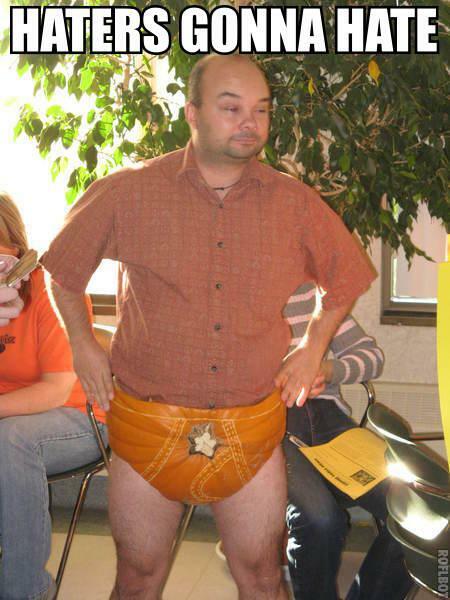 . . though they do look suspiciously like a pumpkin diaper . . . I’ll submit another of what he looked like this year when I get the time. yeah, yeah, i get it. i didnt know what ROFLBOT was until i checked it after i made my first post. that is what the incoherent tirade above is all about. I’ll leave you alone. You’re high. I’m drunk, but I’d ALSO like to be high. Gonna watch The X-Files & eat potato chips instead. Lousy haters . . .
Why are you taking pictures like this of your boss? And here I thought it was Casemod’s Halloween costume.